On 13 April 1933, Tang Shiu Kin, William Louey Sui Tak, Lui Leung, Tam Woon Tong and Lam Ming Fan established The Kowloon Motor Bus Company (1933) Limited (KMB), which was granted the right to operate franchised bus services in Kowloon and the New Territories. There were 106 small single-deck buses in the embryonic KMB bus fleet, offering two classes of seats, namely first class (with cushion) and second class (without cushion) wooden seats. By the time of the Japanese occupation in December 1941, KMB had 140 buses operating on 17 routes. With its buses requisitioned by the occupying force, KMB operations came to a virtual standstill, with just two routes still running in 1944. By February 1946, in order to resume a full service to the community as soon as possible, KMB converted some second-hand military trucks to carry passengers. At the same time, the class seating was abolished. After the war, the population of Hong Kong soared. 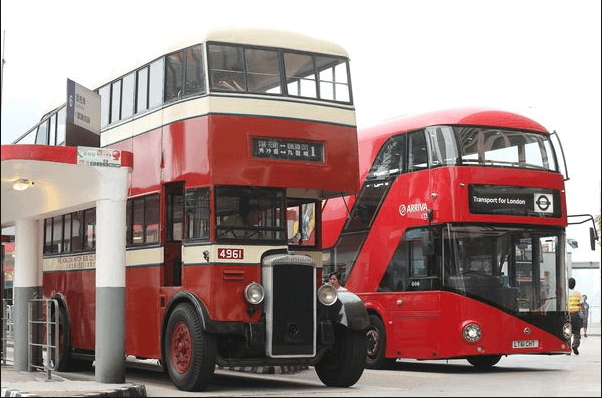 To handle the increased demand for its services, KMB supplemented its fleet with 20 Daimler A buses from England, becoming in the process the first bus company to introduce double-deckers to Hong Kong. KMB established bus stops on all its countryside routes on roads where previously passengers could get on or off buses as they wished. One year later, the Daimler A buses were fitted with front doorways and sliding metal gates, operated by conductors. …and ends in 2014, KMB continued to strengthen and enhance its bus route network through bus route reorganization that was successfully implemented in Yuen Long, Tai Po, Sha Tin and Tsing Yi. KMB launched the first multifunctional “KMB Customer Service Centre” at the Tai Lam Tunnel Interchange (Yuen Long-bound) for trial in order to provide more customised services during busy journeys. The new KMB Customer Service Centre provides passengers with services such as the Octopus Card add-value service, the chance to buy daily items and free Wi-Fi. KMB also introduced the“KMB and LW Smartphone App” Beta Test on Estimated Bus Arrival Time providing real-time bus trip information to facilitate journey planning. Marking a milestone for a more environment-friendly fleet, KMB introduced Hong Kong’s first double-deck bus powered by a Euro VI hybrid engine, “hBus”, which entered passenger service to serve three urban routes. As a sign of continuously upgrading the fleet, KMB retired the last batch of air-conditioned buses with the “3+2” seating layout. After the retirement, all KMB buses have the wider “2+2” layout of seating. Furthermore, the first of KMB’s new 12.8-metre buses, the longest bus in Hong Kong, entered passenger service in August, serving Route 73X. This article was first posted on 27th June 2015. It’s worth noting that the Tang Shiu Kin mentioned above is the same Sir Tang Shiu Kin (March 21, 1901 – June 19, 1986) after whom many schools and sports facilities in Hong Kong are named, as well as a hospital and two dental clinics. According to Chinese Wikipedia — he doesn’t seem to have an entry in the English version — he was born and died in Hong Kong to parents from Jiujiang, Guangdong. Among his many roles, he was chairman of Tung Wah Hospital and the Po Leung Kuk charitable organization, co-founder of the Hong Kong and Yaumatei Ferry Co., and a shareholder in many, many notable Hong Kong companies.